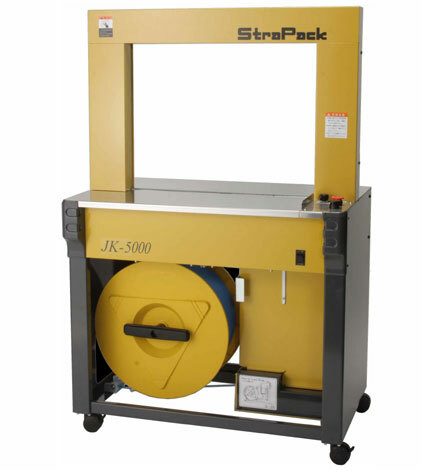 The new JK-5000 is the entry-level arch strapping machine from Strapack. It takes the place of the discontinued JK-5. The JK-5000 has several new features, but offers the same affordable price point. Strapack added a pool box, which improves speed, because the machine can forward and reverse strap into the pool box without having to pull it off the coil. It also has an improved brake system and an automatic step-by-step diagnostic system. It plugs into a standard, 120 VAC outlet. The Strapack JK-5000 is capable of speeds up to 37 straps per minute. It is much faster and more reliable than many of the Chinese arch machines on the market. What sets this machine apart from the Chinese machines is that we stock many parts for this machine, and the Strapack division in Union City, California stocks them as well. The Chinese machines usually do not have a reliable parts distribution network, rendering the machines useless if you have a problem a few years down the road.